Below are pictures of our Nigerians. Our goats are going to be used mostly for dairy purposes. For more pictures, visit our facebook page! This is Pepper. 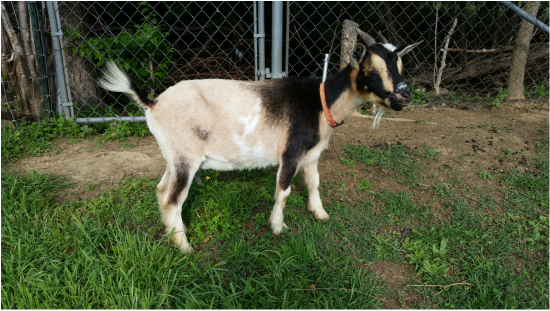 Pepper (sister to Levy) was born in November 2013 and has gone through her first winter here at Tiny Creek Farm. She has blue eyes and is considered a light buckskin. She is very curious and loves attention! She is the complete opposite of her sister Levy. She loves sweet feed and back rubs. This is Levy. Levy (sister to Pepper) was born in November 2013 and has gone through her first winter here at Tiny Creek Farm. She has blue eyes and is considered a light-medium buckskin with white overlay. She is very shy and timid but always looks like she has a small smile on her face. She has warmed up to us some but we still have a ways to go. This is Paisley. Her estimated birth was around March 2013. She is very shy around us and still won't come up to us on her own but we are working on her. Giving her lots of love and treats to show her we care! She has brown eyes and a black and white coat. This is Ice. Her estimated birth was around March 2012. She is a sweet goat and loves attention. She doesn't really like to share the attention with the other goats. She has ice blue eyes and a grey roaned colored coat with a white patch on her right side. This is little Miss Daisy. She was born June 10, 2014. She was our first bottle baby and we enjoyed every minute of it! She is on the smaller side. No matter where we are she isn't too far behind. She has brown eyes and a light brown coat with white patches on her right side and dark brown moon spots scattered all over. 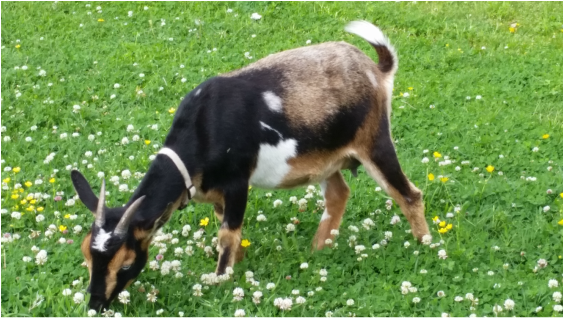 This pretty little goat's name is Gwenivere but we call her Gwen for short. We got Gwen at an auction and we feel lucky to have gotten her. We think her estimated birth is December 14, 2013. 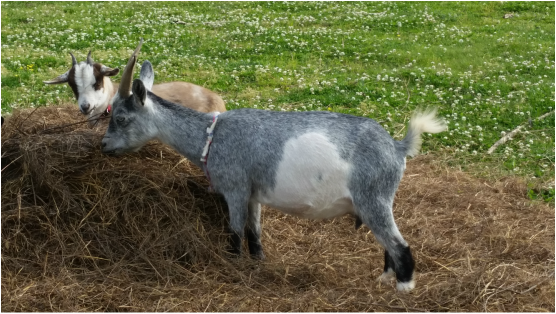 She is one of our sweetest goats in the herd. She has blue eyes and her coat is dark buckskin and she has at least two moon spots. This is Luna. This doe is about 3 years old, November 11,2012. She has brown eyes and wattles. Her color is considered black agouti. She is a little timid but she is starting to warm up to us now. This Portia, she is actually only 3/4 Nigerian Dwarft and 1/4 Toggenburg. She is definitely the herd queen on our little farm. She is about was born on December 7th, 2013. This is Janice, she is one of our newest does. She has pretty blue eyes and her color is Chamoise with with white, white poll. She wasn't a bottle baby but sure acts like one! She has a very sweet personality. This is Violet, she has brown eyes and is a roan color. She is a bit shy but she is warming up to us. This is Moira, she is a bit older than every one else. She also has brown eyes and is a roan and white color. She is very sweet and isn't too far away, always loves to be around us, looking for attention. 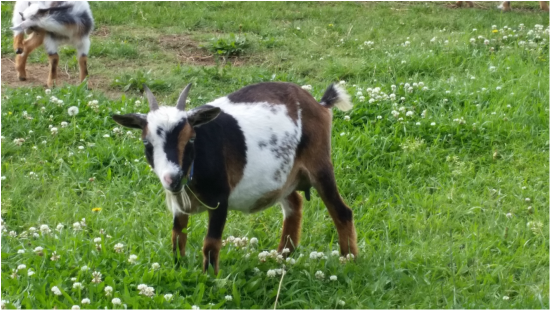 This is another one of our newest goats, her name is Rain. She has brown eyes and is buckskin with white and roan. This is Felicity, she was born in January of 2015, Ice is her Dam. Felicity has brown eyes and a Cou Clair coat. She has Ice's sweet personality and follows us around where ever we go. This is Buttercup. She is our first registered goat. She has bright blue eyes and has a couple moon spots on her. She is our second bottle baby. This is Striker. He is currently our herd sire. He has the sweetest personality and loves being rubbed under his chin. He has beautiful blue eyes and a few moonspots on him. He is from great milk lines and was born on December 7th, 2013.